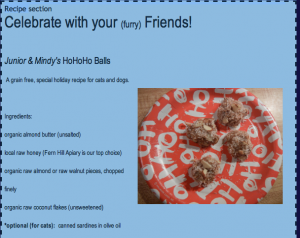 Try this tantalizing treat for your cats and dogs – it’s easy and they’ll love you for it! 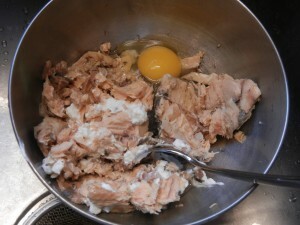 Drain canned salmon. Keep “juice” in a glass jar – you can use a little at a time as a meal enhancer later. 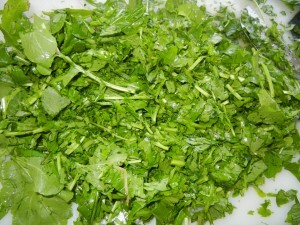 Place chopped parsley on dish. 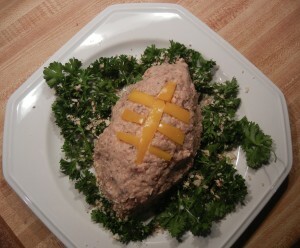 Form salmon mixture into a football shape and place on “field” of parsley. Cut part of bell pepper into thin strips and form into “seam” of football. Finely chop almonds and throw on as “dirt”. The parsley will help with fish breath. Making holiday cookies and looking for a recipe for grain free, healthy cat and dog treats that your companions will love? These are easy, fun, fast - and pooch and feline tested! 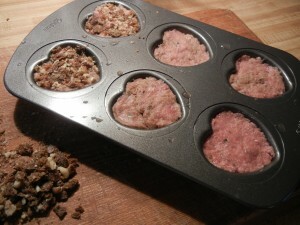 A healthy, grain free treat for cats and dogs. 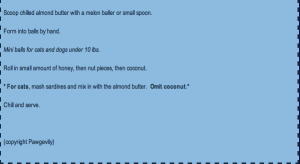 Hint: put the almond butter in the freezer for a little bit before making – the balls will form easier. The short answer is yes, it’s OK to feed. The longer answer is why there’s variation in color and appearance from batch to batch. Pawgevity is an artisanal food. That means it’s made in small batches. Although the ingredients and amounts remain the same from production run to production run, there will always be differences in appearance – some more noticeable than others. Fresh produce sometimes contains more moisture, particularly if picked after a rainfall. It will also vary in color – for instance, one of the leafy greens we use is Swiss chard. 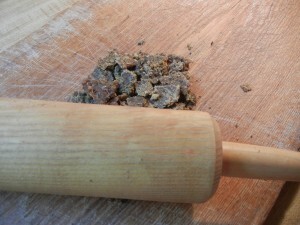 Sometimes it’s rainbow chard, which, when pureed and mixed with all the other produce, tends to get very dark. Beet greens are gorgeous vibrant colors before pureeing – after, not so much! Sometimes, the more moisture filled produce leads to a “wetter” mix. When frozen, some of that mix will rise to the top and sides of containers – thus the darkish layer. Batches vary in color and appearance. 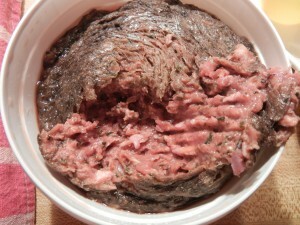 There can also be a difference in appearance and color of animal meats from one run to another – depending on time of year and breeds. Since we don’t chemically treat our foods in any way (remember the recent “pink slime” story? ), they won’t always look exactly the same – uniformity doesn’t exist in the natural world. Junior and Mindy thought they were just going for a ride. We had other plans. We were headed to (shhh) the V-E-T’s office for an official weigh-in. Hey, this isn't so bad! They fooled us – they pranced right into the Marshall Veterinary Clinic like it was their favorite place on earth. 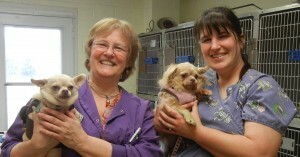 Happy, effusive greetings from Dr. Becky Verna, also of Paws for Holistic Pet Care, didn’t hurt. But, it was time for business. Their last weigh-in was on Valentine’s Day, before we’d met them – Junior was at 10 lbs. and Mindy a whopping 13.2. We’d decided not to do an in home weigh-in as we really wanted an accurate reading of how they’re doing. Kathy and Dr. Verna did the honors. We are ecstatic to announce the results! Junior is now at: 8.6 lbs.! 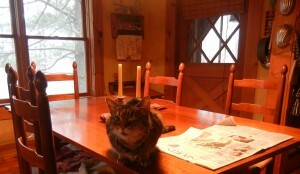 Mindy (drum roll): 11 lbs.! We’re very proud of our “little” chichis. More on how they’ve obtained those losses in our next post. Eat Your Fruits and Veggies! For Cats and Dogs, too. Another RAQ. “Wow, why all the veggies? What percentage of the food is plant matter? I’d rather see more meat and less veggies. ”. Actually, the list is long and it may seem like a lot of produce but it’s a small percentage of the actual food ratio. Each ingredient provides a very important benefit. Our Cat Formulas are 90% protein/10% produce. Our Dog Formulas are 80% protein/20% produce. The produce plays an important part in ensuring that the animals get phytonutrients and other essential nutrients from whole foods – as opposed to adding synthetic vitamins, minerals and inappropriate ingredients. Cats are obligate carnivores. Dogs are opportunistic omnivore/carnivores. It has been observed, by scientists and those in the field, that both wild and domesticated cats and dogs “graze” when given the opportunity – most all of us have seen cats and dogs chomping on grasses, goodies in the vegetable garden, and fallen fruit. They are self healers and will eat what their bodies need, when left to their own devices. When they down herbivorous prey, they often go for the stomach contents first – which contain ground produce. All of our Formulas have been carefully formulated and approved and are recommended, fed, and sold by wholistic vets very knowledgeable in nutrition and with decades of experience with raw feeding, in particular. What’s your animal’s favorite produce? Junior and Mindy have been with us a week now! Their first night home we mixed a very few pieces of their kibble with Pawgevity Chicken Formula, cooked. We decided to take the conservative course as they’ve had so many changes in their lives recently. Overnight and the next morning, there were no signs of digestive upset. As of their next meal, we nixed the kibble altogether. In the past week, they’ve had cooked Pawgevity only, carefully measured prior to sauteing. We’ve switched it up randomly between Chicken and Lamb Formulas, with no detrimental effects. We’ve seen a humongous difference in their stools – quite literally, when it comes to size (sorry, no pictures). Both dogs seem to be gaining energy. And they’re still detoxing, that’s for sure – but not on the extreme end. Their mild detox symptoms range from runny eyes to Mindy exhibiting a limited amount of paw licking. We’re quite pleased with their progress. How do I put this delicately? 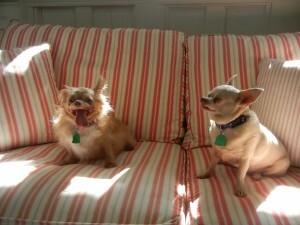 Our newly adopted, wonderful and sweet Chihuahuas, Junior and Mindy, are, well – ahem, a tad chubby. Chunky butterballs, really. This makes them extra adorable. It also, statistically, will take two years off their lifespans. It’s time to get to work. A bit of background. Junior and Mindy originally hail from South Carolina – they ended up with a rescue group there when their person passed on. They’re a bonded pair of littermates, almost 7 years old. 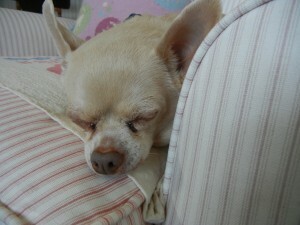 Several months later, they were transferred to one of our favorite rescue organizations, Paws for Seniors. They began the weight loss process with them. We brought Junior and Mindy home with us as fosters, six days ago – our household includes four senior cats with special needs and we had to make sure that they would be comfortable with any new additions to our family. It was almost instantaneous. We’ve now officially adopted them. We want Junior and Mindy to live long, healthy and happy lives – as we wish for all of your animals. As we guide them through their weight loss program, we plan on sharing their progress with you, in hopes that their improved selves will help others out there. Excuse me, it’s time for our walk! We’ve been having some fun in the test kitchen. Give these easy heart healthy recipes a try – your cats and dogs will love you for it! 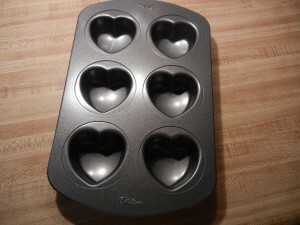 We found this neat mini heart cake pan at our local craft store but any mini muffin pan will do the job. Take Chewz and nuts and crush and mix together. Place a layer of Chewz/nut mixture in bottom of pan (no oil necessary). Add raw Formula to fill and pat in well. Add another layer of the Chewz/nut mixture. Cool and remove from pan. 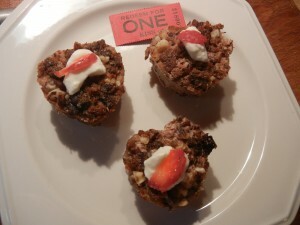 Garnish with a small dollop of yogurt and slice of strawberry or sweet red pepper and serve. Same as above, with the addition of organic coconut or extra virgin olive oil. 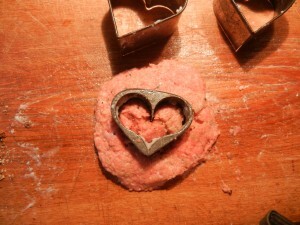 We used these heart shaped cookie cutters – if you don’t have any, you can form patties by hand and cut a heart shape out with a knife. Roll out thawed Formula, thickly (about 1/2″ thick). Take cookie cutter and grease with oil. 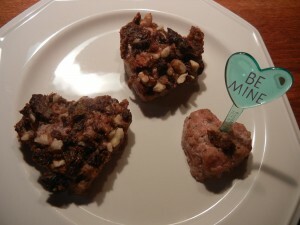 Use cookie cutter to cut out hearts, then press Chewz/nut/seed mixture firmly on top. Remove cookie cutter and place hearts on oiled cookie sheet. Bake at 350 degrees for ten minutes. Make extra and share with your animals at your local animal shelter. Share the love and share your sweetheart stories with us! 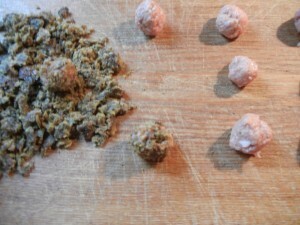 Superballs are a grain free, guilt free, healthy and wholesome goody for cats and dogs. You can make as many or as few as you’d like. Take Chewz and crush into small pieces, using a roller or by hand. 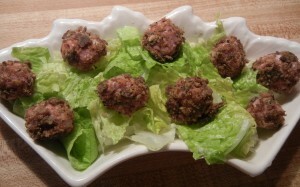 Form thawed Formula into small meatballs. Roll meatballs in the crushed Chewz. Serve on a field of shredded greens.